Pet Emergency? Call us right away at 415-387-6752! If you live in San Francisco or the surrounding area and need a trusted veterinarian to care for your pets – look no further. Your pets’ health and well being are very important to us, and we take every possible measure to give your animals the care they deserve. Presidio Way Veterinary Hospital is a full-service veterinary hospital offering the best quality pet medical care and diagnostics. We take pride in our upscale hospital with the latest technology and support specialists. Because we take the time to get to know your pet, we can better understand his or her needs. Our up-to-date veterinary methods and caring communication will assist us in helping you ensure your pet’s life is happy and healthy. We are happy to offer a number of resources that enable you to learn about how to take better care of your pets. Please feel free to browse our site, particularly the informational articles. The best veterinary care for animals is ongoing nutrition and problem prevention, so becoming knowledgeable about preventative pet care is essential to the ongoing success of your animal’s health. If you have any questions, call 415-387-6752 or email us and we'll promptly get back to you. 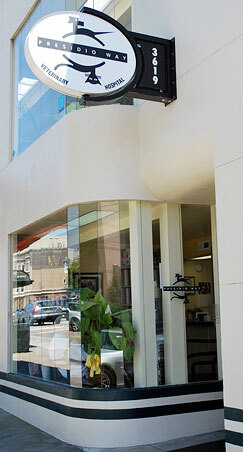 Our San Francisco veterinarian office is very easy to get to -- and you can find directions on our Contact Us page! We also welcome you to subscribe to our newsletter, which is created especially for San Francisco pet owners. At Presidio Way Veterinary Hospital, we treat your pets like the valued family members they are. At Presidio Way Veterinary Hospital, our mission is to provide your pet with the best possible comprehensive animal health care available. We understand that your pet is an important member of your family. Our state-of-the-art veterinary facility ensures the highest standards of professional care. "I've been bringing my cat to Presidio Way since I adopted him, and am always confident that he receives excellent care. After a dental cleaning the Dr. called personally to follow up and make sure my cat was okay. He rocks and so does Presidio Way!"